WASHINGTON -- A Volkswagen PowerPoint presentation from 2006 described “in detail” how the automaker could cheat on stringent U.S. emissions tests, the New York Times reported. Citing two unnamed sources who had seen the presentation, the report explained how a piece of code embedded in diesel engine management software could tighten pollution controls only during emissions tests by recognizing the predictable pattern of government testing cycles, the Times said in a story posted Tuesday. On the road, engine management equipment to limit nitrogen oxide emissions were disengage. The presentation was unearthed through the ongoing investigations into Volkswagen, the Times reported in a story datelined from Frankfurt. VW last year admitted to selling 11 million vehicles worldwide with software designed to mask emissions in government lab tests. The presentation was prepared by a “top technology executive” at VW, though the executive was not named because of German privacy laws, according to the paper. Volkswagen declined to comment on the report when contacted by Automotive News Europe sister publication Automotive News. In 2005, VW decided to make diesel powertrains a key element of its strategy to grow sales in the U.S. The backbone of that push was a new 2.0-liter turbocharged diesel engine engineered to meet U.S. emissions standards, which were and are much more stringent than in Europe. 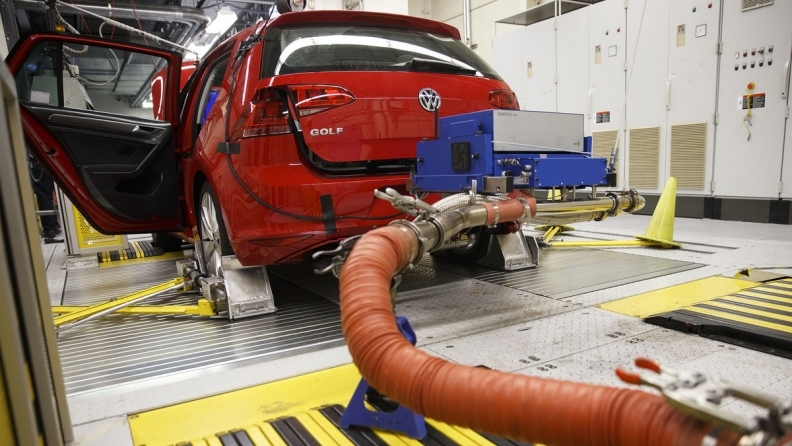 For its U.S. market diesel engine, VW had chosen a “lean NOx trap” to clean tailpipe emissions. The trap captures smog-forming NOx emissions in a special catalyst in the exhaust system, which are then burned off by injecting diesel fuel into the trap. When it debuted in 2008, the system was viewed as a major achievement, producing emissions that complied with tough U.S. limits at a lower cost than was possible when using selective catalytic reduction -- an alternative “clean diesel” exhaust after-treatment technology used by competitors such as Daimler and BMW. VW now also uses selective catalytic reduction systems in its diesel vehicles. Yet Volkswagen encountered a problem. According to the Times, VW engineers in Wolfsburg realized that the engine’s emissions control equipment would wear out too early when calibrated to pass U.S. emissions tests. Volkswagen’s management board rejected proposals from lower-ranking employees to upgrade the diesel engine’s emissions control hardware because of cost, the Times reported, citing two unnamed sources who attended the meetings where the proposals were discussed. The PowerPoint presentation outlining how software could be used to alter emissions output during government lab tests offered a solution to the problem. Volkswagen has been consumed by the diesel emissions crisis since the U.S. Environmental Protection Agency announced VW’s use of illegal “defeat device” software last September. On Friday, the automaker posted a 1.36 billion euro net loss -- its largest in its history -- for 2015 as it allocated 16.2 billion euros ($18.2 billion) to cover the costs of the scandal, more than double what it had set aside previously. Last Thursday, VW and U.S. authorities outlined a broad plan to settle many of the U.S. government’s charges against the automaker. VW agreed to offer buybacks for some 482,000 2.0-liter diesels sold in the U.S. and provide compensation to affected owners. Final consent agreements with U.S. Department of Justice and Federal Trade Commission are due by June 21. The automaker also faces an ongoing criminal probe by the U.S. Justice Department. VW hired U.S. law firm Jones Day to conduct an internal investigation, but the automaker on April 22 announced it postponed plans to release its preliminary findings, saying that it would wait until it finalizes a deal with the Justice Department. VW had previously said the preliminary findings would be announced during its annual press conference on Thursday.